Meet others in Fayetteville with our Meetup Group. Whether you’ve never tried rock climbing, just recently started climbing, or are a seasoned climbing veteran, Triangle Rock Club Meetups are the place for you! 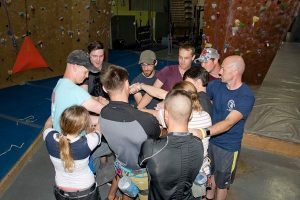 Our goal is to grow a community of people with a passion for climbing and fitness while simultaneously creating unique, shared experiences at Triangle Rock Club Fayetteville. We organize engaging and fun events, unique social outings, skills and equipment demos. Triangle Rock Club Fayetteville Meetups are the prime way to get to know fellow climbers and develop new friendships within the climbing community! Your first Meetup visit is free and includes a day pass and harness rental, subsequent visits are $10 for Fayetteville (harness rental included!). Outside of Meetups, Day Pass rates are $13 for climbing at Triangle Rock – Fayetteville.